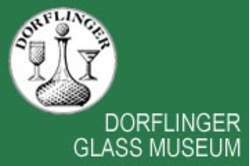 The Dorflinger Glass Museum houses one of the nation's largest public display of Dorflinger crystal. The museum maintains elegant displays of fine cut, etched, engraved, gilded and enameled crystal produced in Christian Dorflinger's factories between 1852 and 1921. An on-site gift shop features an array of wares including glass jewelry and handcrafted ornaments. Groups are welcome. Enjoy elegant displays of fine cut, etched, engraved, gilded and enameled crystal.